Have You Fallen Fall Into This Trap? 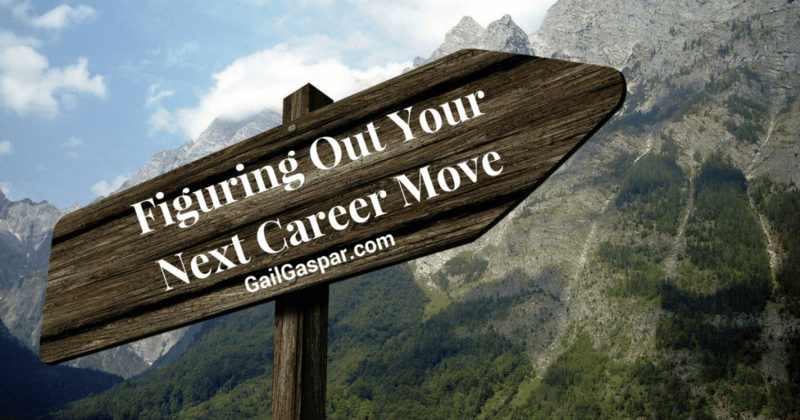 Ever set aside time to work on getting to the next stage of your career, only not to set aside the time to work on…moving to the next stage of your career? You took a day off, set aside time on your calendar, turned off phone alerts. And accomplished nothing. Your inner critic shrieked things you could not shirk. Things like, What’s wrong with me? Why can’t I do this one thing? I’m not equipped. I’m not ready! I’m not good enough to accomplish this!! It doesn’t matter. Ugh!!! Lots of people fall in to this trap. Thing is, you don’t talk about it. It’s not the stuff of conversation. The hopelessness. The shame of not moving faster, forward. It’s embarrassing. Vulnerable. So…you bury it. Push it down. Down deep. Perhaps you come to accept that nothing is ever going change. I worked with one client who began coaching with a request. It was to help her endure five more years of a job that was choking her confidence, her marriage, her well being. It was a job she used to like but had come to despise. Her body slouched, gaze was hollow, voice monotone. Of these, she was unaware. Work she did used to matter but it had been years since she or her work were recognized. A work setting that used to be positive but had turned negative. It took two years for her to take action to contact me. Would I help her endure a situation that had her in a chokehold? “Hell no,” I said. You’ve come to the wrong place if what you’re after is enduring something you hate. We’re going to shake up the status quo. How you’ve been going about making change is not working for you. We’re here, you and me, to find out what you want next and help you get that. Within weeks, she had squarely faced what she was resisting (for years!) and learned how to manage doubts that previously slayed her. Powerful assessments showed her what she valued now, what strengths she would align at work to make it work for her. It helped her to have outside accountability to make the changes and she was finished before her package came to an end. She found her freedom in writing, guitar, and cultivating new connections. She found renewed energy to network which resulted in landing in front of those who would recognize and value her strengths. You see, if you’re like my former client, you might be an Obliger, someone who needs some outer expectations to get work done. 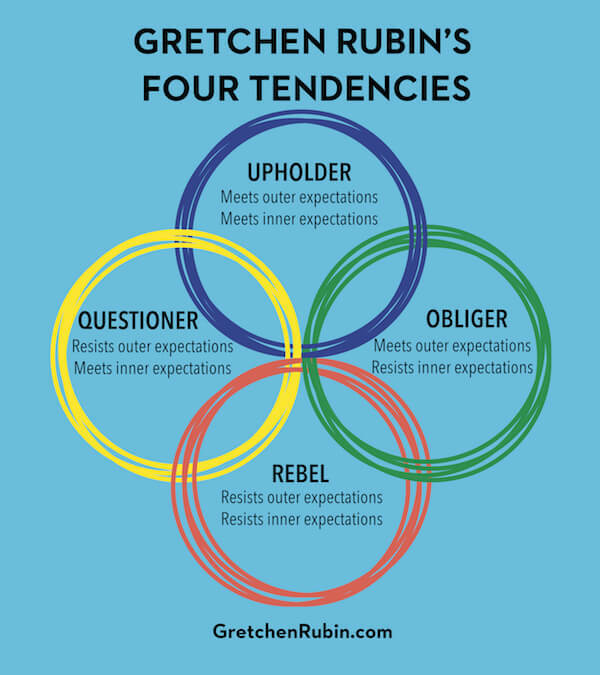 Gretchin Rubin, author of Better Than Before and The Happiness Project, recently wrote a new book called The Four Tendencies, about the 4 personality types based on how we react to internal and external expectations. After reading about it (it’s available for pre-order), I realized it gives a whole new framework of possibility for anyone who’s struggling to activate their next-stage career plan and I wanted to share the concepts with you. In coaching, as in teaching, there is no one-size-fits-all. I create custom experiences, work with natural tendencies – not against them – as most of us are prone to do on our own. If you’re intent on getting your next re-invention out of your mind and into being, I know Rubin’s format for understanding you will soften the approach. 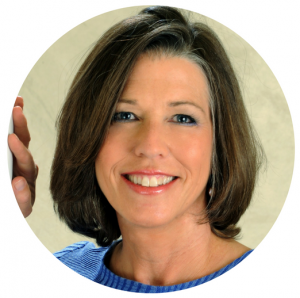 Leading True Challenge: Take the quiz.. Watch the video that corresponds to your tendency. Then, I’d love to know: What is your tendency? How could awareness of your tendency inform your work? Your life? TELL US in the comments below and on the Facebook Page!